What do you do when you have the skills to grill but don’t have the fancy backyard to pull it off? Recently, a homeowner gave Atlanta Curb Appeal a call because they had a deck but wanted something bigger, something better. We sat down with our client and put together a beautiful design with a lot of custom touches. The “after pictures” look like something out of a magazine. We asked Avi about the new backyard entertainment area. 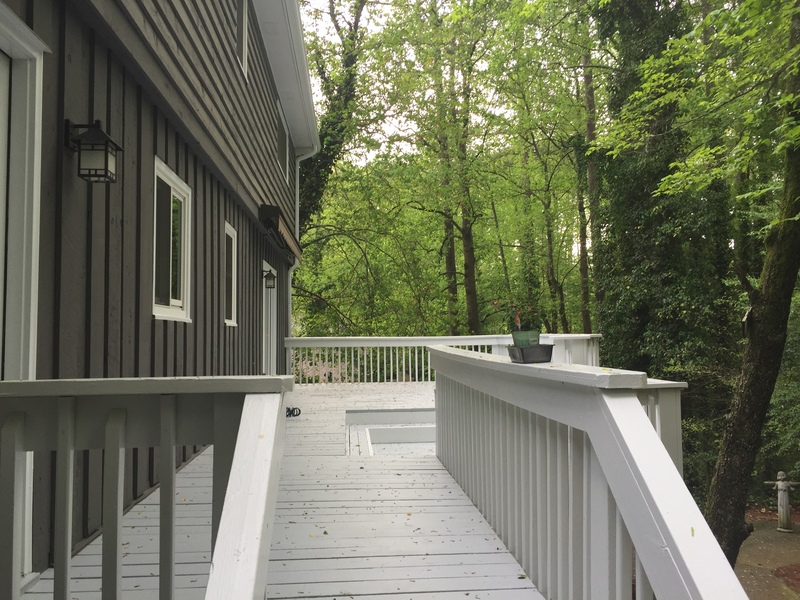 What was the deck like before Atlanta Curb Appeal started? Their original deck was small and made from pine. Our client was looking for a larger entertaining space, so an extension was a must. However, it wasn’t a simple add-on; we changed out all the decking to new cedar boards and added all-new decorative posts and railing. What special features did you add? We added the hot-tub, fireplace, deck and the outdoor kitchen. For the hot-tub, we had to built a reinforced deck to support the weight of the tub and connect it with stairs to the upper deck. Did Atlanta Curb Appeal install the stone on the huge outdoor fireplace? All of the stonework was brand new and installed by Atlanta Curb Appeal. This unique handmade touch gave the deck a warm and welcoming feel. The client was looking for a “million dollar deck”. I think we delivered. Can you tell us more about the new outdoor kitchen? We designed the outdoor kitchen so the BBQ equipment would be next to the edge of the roofline in order for the smoke to dissipate while protecting the cook from the sun and the rain. The cooking area was design around this to create a space with sufficient prep area next to the drop-in grill and Green Egg. Adjoining this area was a seating space for friends so he could visit while cooking. The space was designed for utility but also for optimal entertaining. Just like your indoor kitchen, storage space is key for the outdoor kitchen. We installed full cedar cabinets with rustic hardware underneath the L-shaped kitchen and the countertops were a gorgeous granite complemented by stack stone on the back of the kitchen to match the nearby outdoor fireplace. How did you change the front of the house? We added a custom-designed portico, rebuilt the landing and stairs and resurfaced the natural flagstone and stack stone. 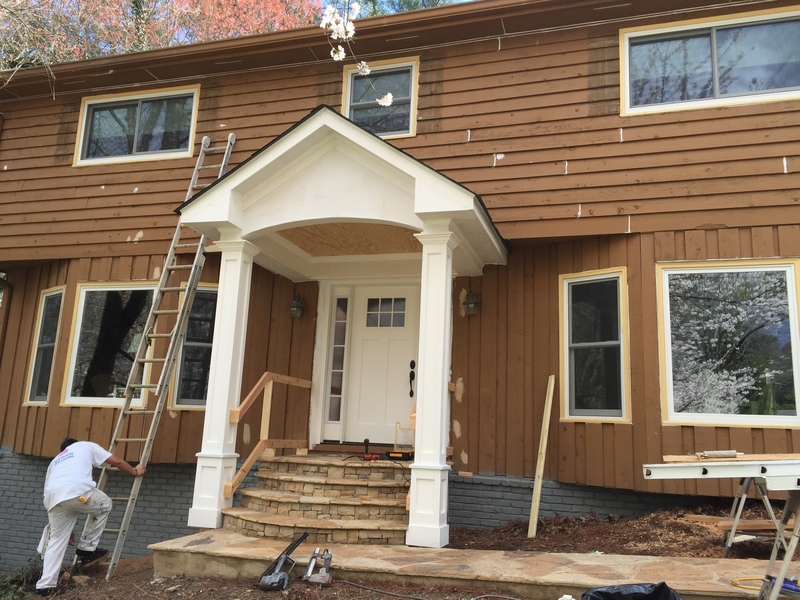 We also installed custom-made shutters out of a beautiful cedar, which we stained and sealed with a protectant We recommended the cedar to go with the rustic look of the home and it tied in beautifully with the new cedar deck. How did they find you? They found us by word of mouth. 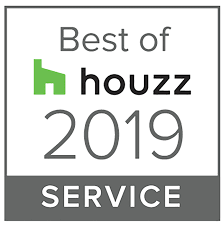 We renovated their friends’ house in the neighborhood, and they recommended us. How long did it take, and how did they feel about their experience? This project took about four months, including the holidays and the vacations in between. The clients are ecstatic with the end results. In our next blog, we will continue with the details of the indoor renovation that we also provided for client. 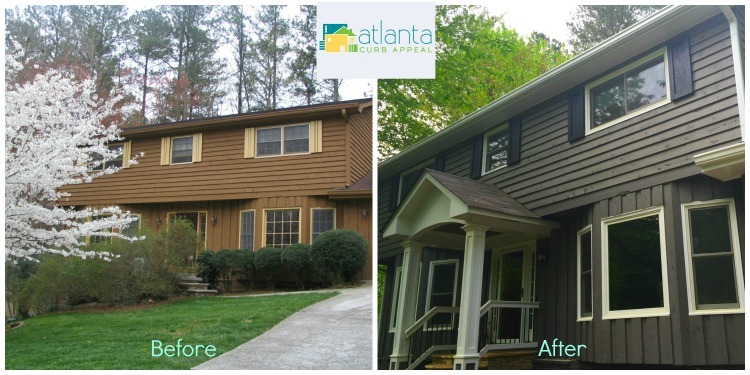 Atlanta Curb Appeal provides free estimates for home interior and exterior renovations. Please read our reviews on Facebook and follow us there to stay up with the latest designs. We also have a large gallery on our website. Astonishing Transformation of this East Cobb Home! 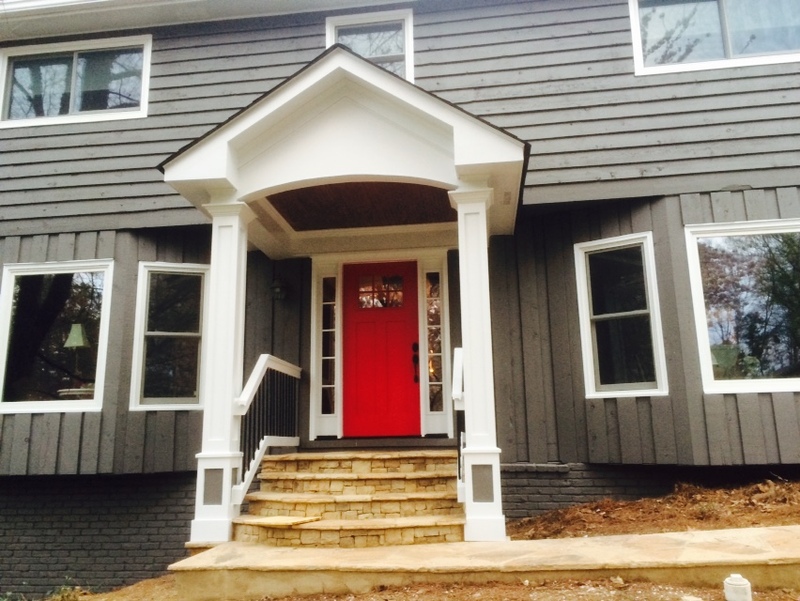 Recently Atlanta Curb Appeal wrapped up another amazing whole house makeover in East Cobb, GA! Below is an interview with owner Avi Moyal about the details of the project. It’s a great story including a little bit of mystery we hope you will enjoy reading. I got a call one day, asking me to come and give a quote for some curb appeal work. As always, I ask my new clients, how did they find me? This lovely lady said she is holding a postcard I had sent her in the mail recently. I was shocked to hear that because the only time I did mass postcard marketing was exactly 3 and half years ago. I had to go and see it with my own eyes, so I got in my car and drove straight to her house. And there it was, the postcard I printed almost 4 years ago was there in her hand! No idea how that happened. A mystery maybe the USPS can solve for me! Why did they select Atlanta Curb Appeal? Did they get other quotes? The client got 3 quotes, one was a little lower than ours but she did not feel that he could deliver. The second quote was considerably higher than mine. She went with ours because she liked the design ideas I proposed. A few years ago she had the front landing and stairs done and she didn’t like how it turned out at all. So we came up with a new design that included demolishing the existing one and building it from scratch, which we then covered with a beautiful natural stone all the way to the driveway. What projects did you complete in the home? Demolition the front porch and rebuild new rounded stairs and cover with natural stone. Why did they choose to have the hardwood floors refinished? Actually she hadn’t decided to do it until our initial meeting. They were very scratched, basically due to common wear and tear. During my first assessment, I asked her if she would like to go ahead and refinish them while we were in there doing the renovations. It’s a simple process really since they are solid hardwoods, easily sanded and refinished to any shade one could want. What caused the rotted cedar siding? Was this instance typical of homes of this age? Or was it due to a manufacturer problem? Some decay is normal, part of the aging of the natural cedar siding. Overall though, the siding was in decent condition. Merely a few critical places needed to be removed and replaced. Why did they want to add a portico? What was their inspiration? We went over a few designs however they really liked the portico that is featured on our homepage. Actually the whole color scheme of the exterior of that house was really appealing to them so we went with the same color formulas. Gray with white and black accent and trim colors. Was gray in color in mind from the start? She had gray in mind from the start but not the actual shade of it. All the colors were discussed together and the red door was her special request. Why was the front door replaced instead of painted? The client wanted a new door and sidelites to give a reinvigorated look to the front of the house and to accentuate the attractive new portico. Did you have to resurface the deck before painting? No, it was in good condition, we kept the deck as is, we only pressure-washed and repainted it. Because it had been painted in the past, we couldn’t merely apply a stain over the old deck. 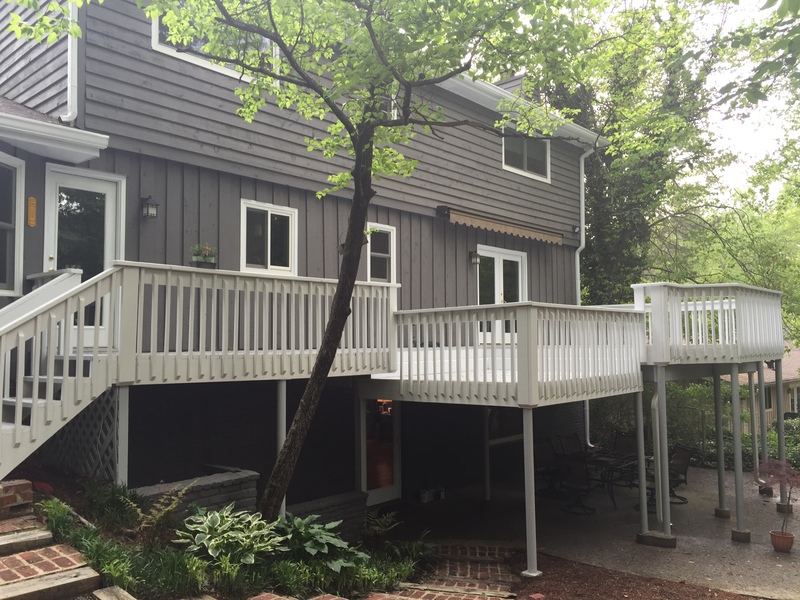 The new deck colors were chosen to complement the new exterior, white for the railing and light gray for the floor decking. The results were amazing, way beyond our expectations!! There is such a clean and neat feeling there now. How many days for each phase of this project? but we were there for almost two months because of rainy days. 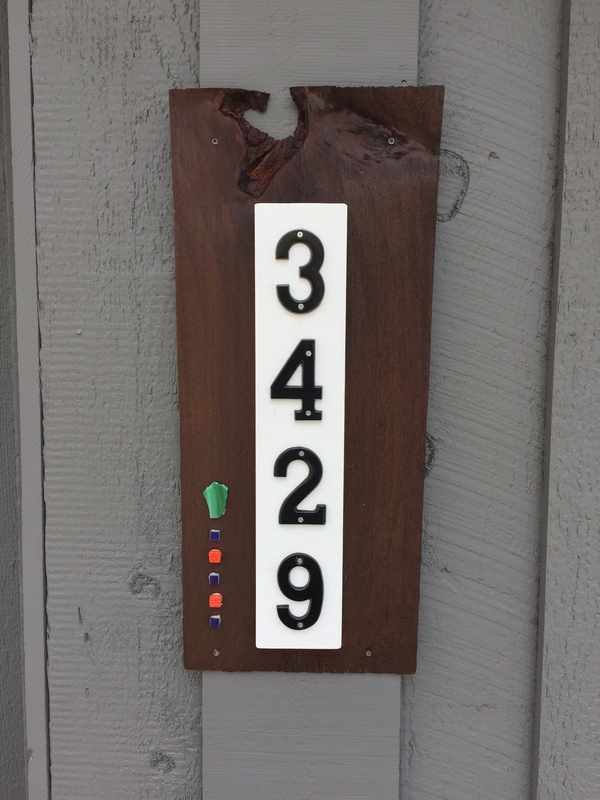 We also installed a new house numbers sign that matched the new look. When we took off the old door, the client wanted to keep these 4 digit metal numbers as a souvenir. I offered to take it home and do something artistic with it. Did they book the bathroom remodel job after they saw and loved your work or was this always in the original plan? Yes the bathrooms came much later in the process; we will start them in a couple of more weeks probably. Are they happy with the finished results? 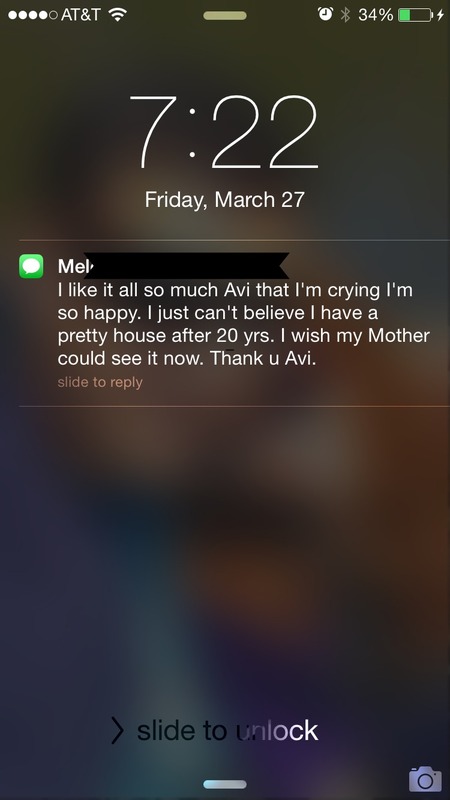 The day we finished, after I got home that evening, I got a text from them saying ” I like it all so much Avi that I’m crying I’m so happy. I just can’t believe I have a pretty house after 20 years. I wish my mother could see it now. Thank U Avi” (see above). This filled my heart with joy knowing we made someone that happy with our work. Sign Up for our Newsletter to Get Stories like these once a month. Would you like to read more makeover stories? Here is an amazing backyard makeover we completed last fall. Click here to see her review. Wow This House Renovation Is Simply Stunning! 1) How did these customers find you? We were working on their neighbor’s house next door and Wendy approached me one day while she was out walking her dog. Wendy asked if I could come by and see her railing. Wendy is a designer by trade and had some ideas in mind for some projects she’d like me to complete in her home. 2) Why did they need a new railing? Was there a rail before? They moved in about a year ago and had nearly completed a major renovation. The railing is the last thing Wendy really wanted to get rid of. It was not updated and did not match the new interior design. 3) How did you decide on this rail style, did the customer already have it in mind or did you help lead them to this decision? 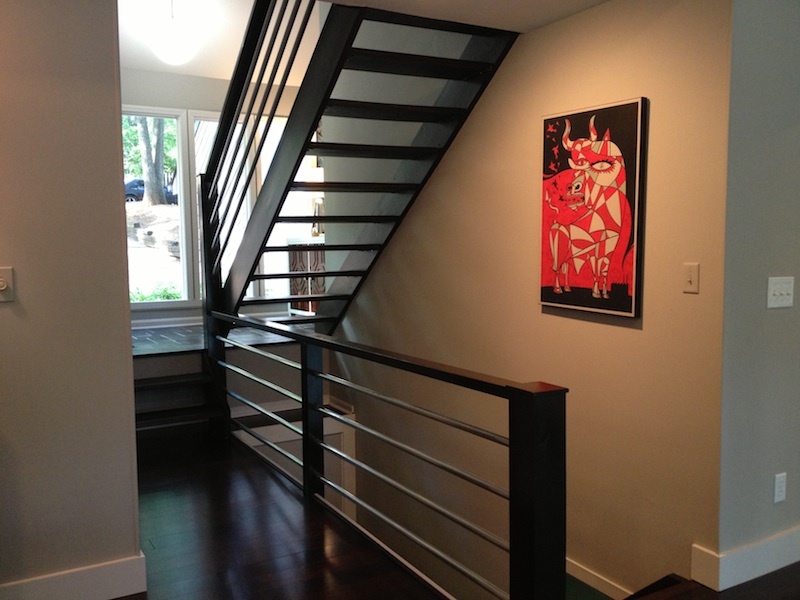 Wendy shared with me some photos of what she wanted and said she was interested in incorporating metal into the design. I suggested a cedar railing and posts (to match other beams in the house and because we decided to stain it all immediately) with aluminum bars. We discussed in great detail the dimensions and the profile type (square vs. round pipe) that would express and continue the artistic lines of the space. I brought them samples from the supplier and we ended up agreeing on the round 1 1\4” pipes. 4) How many days did this project take? 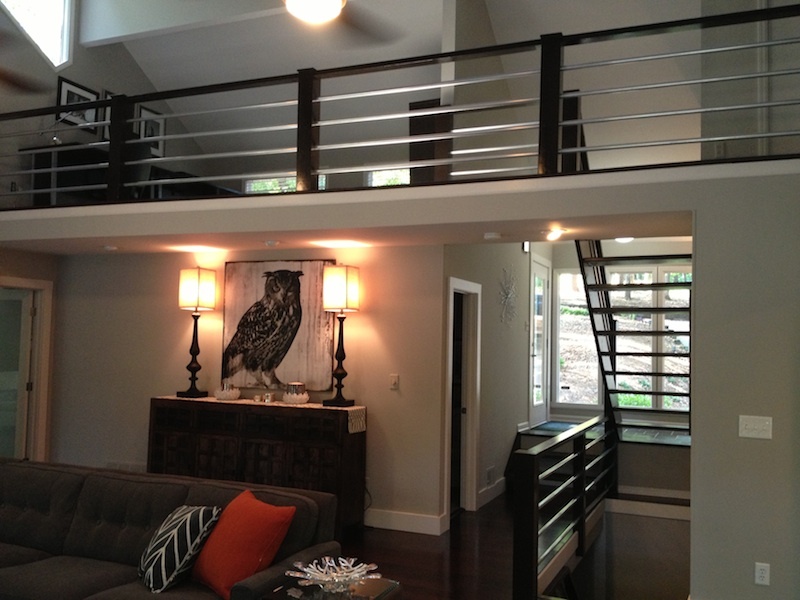 Any issues or challenges people should keep in mind when getting a new railing installed? It took us six days to complete three levels of indoor railing plus an outside small deck and railing system that now match the inside. 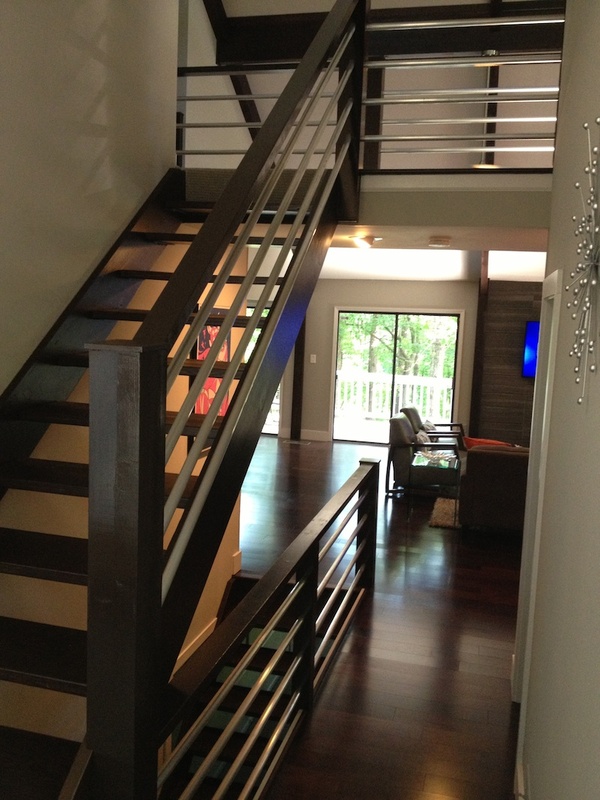 When considering a new railing I suggest investigating the materials and finishes: metal, wood or both? Another decision to be made will be to paint or to stain the wood. 5) How does the customer feel about the project? They are thrilled with this new modern railing. As a designer, Wendy wants to team up with us for her future projects. We look forward to it! Call me now for a free estimate. Want more? Here is the story of a modern bathroom remodel we did earlier this year.